Definition at line 44 of file llfloatermute.h. Definition at line 80 of file llfloatermute.cpp. References LLUICtrlFactory::buildFloater(), LLPanel::childSetAction(), LLPanel::childSetCommitCallback(), FALSE, LLUICtrlFactory::getScrollListByName(), gUICtrlFactory, mMuteList, onClickMuteByName(), onClickPick(), onClickRemove(), onSelectName(), refreshMuteList(), LLScrollListCtrl::setCommitOnSelectionChange(), LLFloater::setVisible(), and TRUE. Definition at line 103 of file llfloatermute.cpp. Definition at line 264 of file llfloatermute.cpp. References LLMuteList::add(), LLViewerWindow::alertXml(), LLMute::BY_NAME, gMuteListp, gViewerWindow, and LLUUID::null. Definition at line 251 of file llfloatermute.cpp. References LLViewerWindow::alertXmlEditText(), callbackMuteByName(), gViewerWindow, and NULL. Definition at line 227 of file llfloatermute.cpp. References LLFloater::addDependentFloater(), FALSE, onPickUser(), LLFloaterAvatarPicker::show(), and TRUE. Definition at line 195 of file llfloatermute.cpp. References LLScrollListCtrl::getFirstSelectedIndex(), LLScrollListCtrl::getItemCount(), LLScrollListCtrl::getSimpleSelectedItem(), LLScrollListCtrl::getStringUUIDSelectedItem(), gMuteListp, mMuteList, LLMuteList::remove(), S32, LLScrollListCtrl::selectNthItem(), LLMute::setFromDisplayName(), and updateButtons(). Definition at line 55 of file llfloatermute.h. Definition at line 239 of file llfloatermute.cpp. References LLMuteList::add(), LLMute::AGENT, gMuteListp, and updateButtons(). Definition at line 185 of file llfloatermute.cpp. Definition at line 143 of file llfloatermute.cpp. References LLScrollListCtrl::addStringUUIDItem(), LLScrollListCtrl::deleteAllItems(), LLMuteList::getMutes(), gMuteListp, mMuteList, and updateButtons(). Referenced by LLFloaterMute(), and LLMuteList::notifyObservers(). Definition at line 161 of file llfloatermute.cpp. References mMuteList, LLScrollListCtrl::selectByID(), and updateButtons(). Referenced by inventory_offer_mute_callback(), and LLPanelAvatar::onClickMute(). 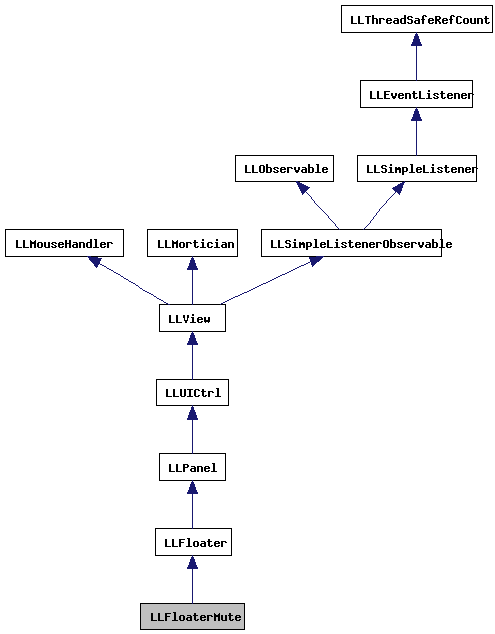 Definition at line 111 of file llfloatermute.cpp. Referenced by LLObjectMute::handleEvent(), inventory_offer_mute_callback(), LLPanelAvatar::onClickMute(), LLFloaterChat::onClickMute(), and toggle(). Definition at line 120 of file llfloatermute.cpp. References LLFloater::close(), LLView::getVisible(), gFloaterMute, and show(). Definition at line 170 of file llfloatermute.cpp. References LLPanel::childSetEnabled(), FALSE, LLScrollListCtrl::getFirstSelected(), mMuteList, and TRUE. Referenced by LLAgent::clearBusy(), onClickRemove(), onPickUser(), onSelectName(), refreshMuteList(), selectMute(), and LLAgent::setBusy(). Definition at line 135 of file llfloatermute.cpp. Definition at line 75 of file llfloatermute.h. Referenced by LLFloaterMute(), onClickRemove(), refreshMuteList(), selectMute(), and updateButtons().